From enterprise website development & Business Intelligence to software product and mobile apps development. We have the experience and the expertise to ensure that your brand looks just as fab online as it does offline. Strong client relationships are paramount. But so is technical superiority and rapid, cost-effective turnaround. With offices in the UK, India and Vietnam, our smart local/off-shore method ensures you benefit from the best of both worlds. We’ve been successfully outsourcing software development for over 13 years, with services spanning across 22 different countries. We specialize in building, and assisting with the management of, offshore development centres and dedicated teams. Actually, make that very excited. And who wouldn’t be when you consider the almost limitless possibilities up for grabs within today’s digital world. 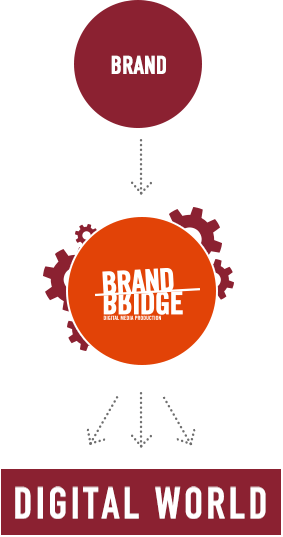 At BrandBridge, our mission is to enable your business to benefit from these possibilities to the max by translating your offline brand into the digital space, seamlessly. Having worked with a wide variety of comms agencies and brands, our knowledge and expertise enable us to provide the perfect strategic digital production partnership. Think of us as an extension of your team; an opportunity to scale-up. As well as bringing your brand to the ‘digital party’, we can manage your entire digital operation globally, ensuring that your brand messages are being broadcast loud and clear, wherever you want them to be heard. When you partner with us you can expect fast and efficient development, as well as seamless brand experience once your project goes live. We work together to define your digital aspirations and objectives. We create a framework within which to deliver your goals. Your digital brand takes shape through design and coding. We launch your brand into the digital space across all relevant channels.